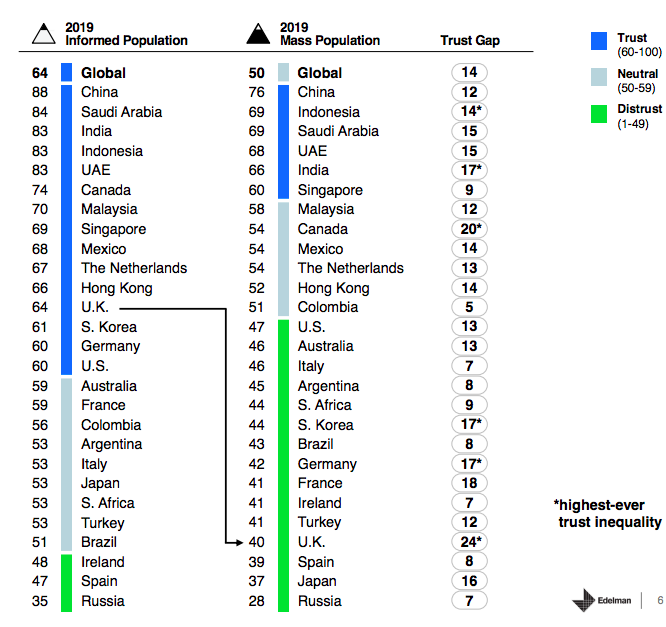 The UK is 'increasingly unfair', deeply divided and far less trusting of institutions and the nation's political leaders, Edelman's Trust Barometer has revealed. There has never been a larger divide between the ‘informed public’ and ‘mass public’. In the UK, only 40 per cent of the mass public say they trust institutions, compared to 64 per cent of the informed public – a record breaking 24-percentage-point gap. This was the largest divide of any of the 27 countries Edelman surveyed. Similar proportions of the informed public (70 per cent) and the mass population (72 per cent) bemoan the lack of fairness they experience in 2019, and similar numbers expressed a desire for change. More than half of the mass population (53 per cent) said they the socio-political system was failing them, with only 14 per cent indicating it worked in their favour. "We are a Disunited Kingdom – a country that is seen as increasingly unfair, less tolerant and headed in the wrong direction," said Ed Williams, Edelman UK and Ireland CEO and vice chairman of EMEA. 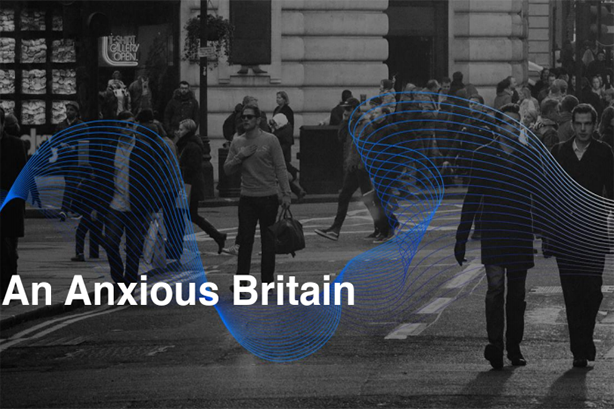 "Brexit has exposed fractures that have split families and divided friends, made us meaner and angrier as a society, and stoked fears of violent protest and civil disorder. "The divisions exposed by our decision to leave the European Union are not binary. They are far more complex. But the consequences are clear – as a country we see our politicians and our political leaders as out of touch, and we lack faith in their ability to heal the divide. Instead, we are looking increasingly to business and to our employers to lead and to act with social purpose." It comes as no surprise that Brexit has broken Britons' faith in government, politics and the political system. Brexit is also having a corrosive effect on how Britons feel about one another, the research found. Since Brexit, 40 per cent of Britons feel others are more likely to take part in violent protest, more than two-thirds (69 per cent) believe fellow citizens are angrier about politics and society and one in six people have fallen out with relatives or friends over the issue of leaving the EU. 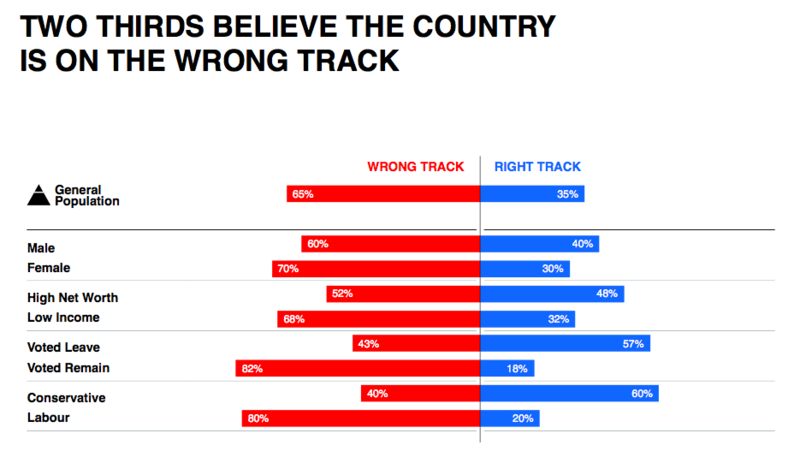 Two-thirds feel the country is on the wrong track, half believe the political system is broken and there have been significant falls in trust in prime minister Theresa May and Labour leader Jeremy Corbyn. Only 35 per cent of those surveyed said they trusted the Prime Minister to do what is right, and just 26 per cent said they trusted Corbyn to do what is right. The British public look to business to fill the shortcomings of government, with more than three in four Brits believing that CEOs should take the lead on change, rather than waiting for the Government to impose it. This is a massive 19 percentage points higher than last year’s survey and illustrates the growing importance of organisations and their leadership managing their reputations. 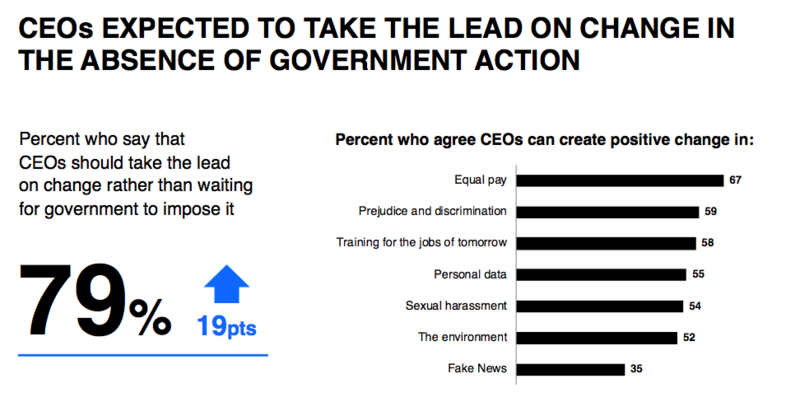 Equal pay, prejudice and discrimination, and training for the jobs of tomorrow were listed as the top areas where CEOs can create positive change. The public also believes a business should focus more on the welfare of its employees (65 per cent), ahead of the customers (47 per cent). Three in four state that how a company treats its employees is one of the best indicators of its level of trustworthiness. The study also highlighted the link between how trusted a company is, and its bottom line – with 60 per cent of Brits stating, ‘a good reputation may get me to try a product, but unless I come to trust the company behind the product, I will soon stop buying it’. Britons are split down the line on whether the way business works is good for British society. The most common response to why Brits aren’t satisfied with business is that two-thirds (67 per cent) thought companies place profits as more important than looking after people, while half (50 per cent) thought that companies did not pay their fair share of tax. Nearly four in ten cite corruption as a major problem. When looking at the relationship between employees and employers, three in four said they trust their employer to do what is right, which is considerably higher than any other institutional relationship in the UK today (see chart below). Employees are also looking to their employer to help navigate and understand the frenetic current affairs agenda in the UK today. Half state they look to their employer to be a trustworthy source of information about social issues and other important topics on which there is not general agreement. The study found several industry sectors in which trust has increased in the past year, including financial services and energy. Although there is very little trust in the media compared to other institutions, Britons are increasingly consuming news. Since the referendum nearly a third (29%) of respondents say they read political news more than they used to and nearly a quarter (23%) are more vocal about politics, claiming they comment on it more than they used to. Although 59 per cent are fed up with hearing about Brexit, more than a third (35 per cent) said there were reading, watching or listening to more news than before – with a large majority of those (71 per cent) doing so to keep up to date with the pace of events. News engagement increased by 22 percentage points, from 41 per cent to 63 per cent. However, the increase in engagement did not translate to a particularly favourable view of the British media - more than half (55 per cent) said that their views were not represented in that space. 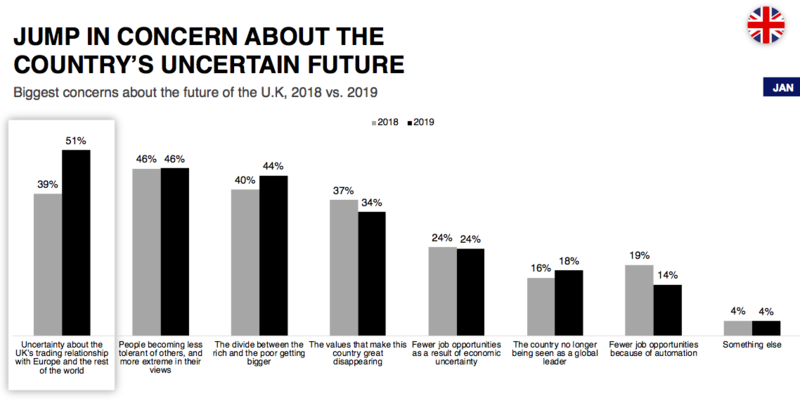 Ultimately, the report's findings ram home just how much political and economic uncertainty is having a huge impact on how Brits feel about the future of the country, their lives and each other.